Westminster Village Kentuckiana provides residential living accommodations plus services for a simple monthly rent charge. 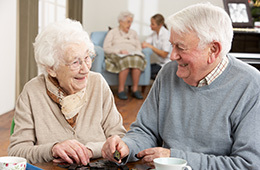 Assisted Living provides accommodations and basic services for a simple monthly service fee. For information on rates for additional care not included in the monthly service, please inquire with our marketing office. Personal care items and medication are not included in the monthly fee. There are no buy-in fees incurred by residents. At the time of move-in, residents submit a security deposit along with the pro-rated rent for the month of move-in. Please ask for the marketing office for more details. You must have Medicare Part A with Hospital Insurance and have days left in your benefit period. You must have had inpatient care in a hospital for three consecutive days in the last 30 days. Your doctor has dictated that you need daily skilled care given by, or under the supervision of, skilled nursing or therapy staff. You need skilled care on a daily basis. A condition that started while you were in a skilled nursing community while being treated for a hospital related medical condition. Special physician ordered therapies such as physical therapy, occupational therapy, respiratory therapy, diagnostic tests, and other specialized care procedures, etc.